The Kentucky Medical Association is the only association in Kentucky that represents all physicians and patients before the Kentucky General Assembly, the courts, governmental regulatory agencies, the media and Congress. The KMA works to protect the practice of medicine in Kentucky and to assure that patients have the access to the care they deserve. The Kentucky General Assembly passed Senate Bill 89 to remove widespread barriers related to tobacco screening and cessation treatments. It takes effect June 29, 2017. Below are some common myths and facts. 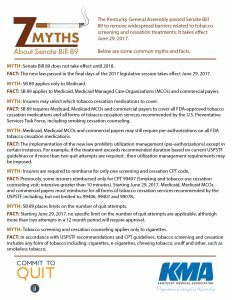 MYTH: Senate Bill 89 does not take effect until 2018. FACT: The new law passed in the final days of the 2017 legislative session takes effect June 29, 2017. 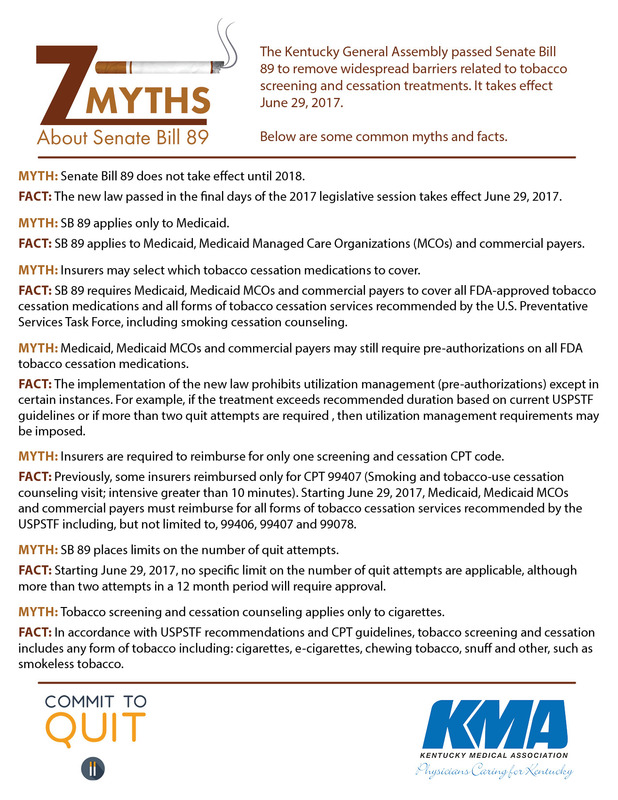 MYTH: SB 89 applies only to Medicaid. FACT: SB 89 applies to Medicaid, Medicaid Managed Care Organizations (MCOs) and commercial payers. MYTH: Insurers may select which tobacco cessation medications to cover. FACT: SB 89 requires Medicaid, Medicaid MCOs and commercial payers to cover all FDA-approved tobacco cessation medications and all forms of tobacco cessation services recommended by the U.S. Preventative Services Task Force, including smoking cessation counseling. MYTH: Medicaid, Medicaid MCOs and commercial payers may still require pre-authorizations on all FDA tobacco cessation medications. FACT: The implementation of the new law prohibits utilization management (pre-authorizations) except in certain instances. For example, if the treatment exceeds recommended duration based on current USPSTF guidelines or if more than two quit attempts are required , then utilization management requirements may be imposed. MYTH: Insurers are required to reimburse for only one screening and cessation CPT code. FACT: Previously, some insurers reimbursed only for CPT 99407 (Smoking and tobacco-use cessation counseling visit; intensive greater than 10 minutes). Starting June 29, 2017, Medicaid, Medicaid MCOs and commercial payers must reimburse for all forms of tobacco cessation services recommended by the USPSTF including, but not limited to, 99406, 99407 and 99078. MYTH: SB 89 places limits on the number of quit attempts. FACT: Starting June 29, 2017, no specific limit on the number of quit attempts are applicable, although more than two attempts in a 12 month period will require approval. MYTH: Tobacco screening and cessation counseling applies only to cigarettes. FACT: In accordance with USPSTF recommendations and CPT guidelines, tobacco screening and cessation includes any form of tobacco including: cigarettes, e-cigarettes, chewing tobacco, snuff and other, such as smokeless tobacco.